This guides provides you with guidelines regarding Copyright and Fair Use. 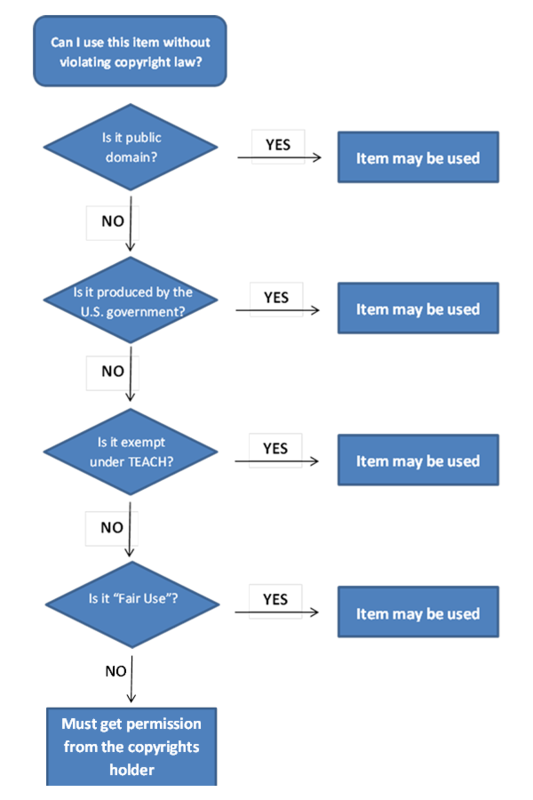 These 'decision tree" helps guide students and instructors through the copyright process. Copyright law protects the exclusive rights of a holder to authorize others to copy, create derivative works, distribute, publicly perform, or publicly display a work. Most copyrights expire 120 years after creation. The work is considered in the public domain after that time and free to use. Works created by the federal government are not subject to copyright and are permissible. If faculty wish to use copyrighted material in an online course the use must fall under the provisions of the TEACH Act or be considered "Fair Use". If the use does not meet one of those criteria, faculty must obtain permission (written in most instances). Three additional requirements must be met. the effect of the use on the market for the copyrighted work - labeled by the Supreme Court as "the single most important element of fair use"
Association of Research Libraries - Know Your Copy Rights Site produced by the Association of Research Libraries to make faculty members aware of copyright issues and best practices. What is a Fair Use? Deciding if what you want to do falls within the Fair Use can be difficult. Following are some links to checklist and evaluators. See if one of them can help you with this decision. And, to be safe -- if it has an option to print the results, do so. Then you can file it with your materials to show that you did your best to follow the law based on the expertise and advise of organization that should know.